An assortment of lanterns hang from the pavilion in the Chinese Garden at the Montreal Botanical Garden in Quebec, Canada during the yearly Magic of Lanterns Festival. Very delicate and unique lanterns celebrating the culture of China are displayed in the garden and float atop the surface of the lake during this event. As darkness settles in around the Chinese Garden, the lanterns are illuminated creating a beautiful scene. Not far off in the distance, the Montreal Tower stands at 575 feet where it leans at a forty-five degree angle. A famous tourist attraction where people can journey to the top of the tower and view Montreal, Quebec from the observation decks. Montreal Tower and a pavillon at the Chinese Garden at the Montreal Botanical Garden, Jardin Botanique de Montreal, Hochelaga-Maisonneuve, Montreal, Quebec, Canada. 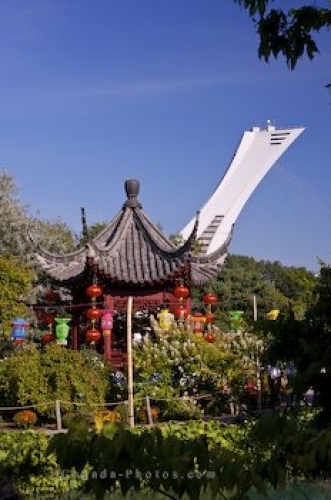 Picture of the pavilion at the Chinese Garden in Quebec, Canada and the Montreal Tower.